Would you like to visit us with a larger group? Perhaps you are searching for an excursion for students? Regardless of whether you are a primary-school teacher, a pensioners’ group leader or a cultural attaché of an embassy, you are warmly invited to attend our personalized programs. On the exhibition, you have the option to assemble your own program, selecting which scientists’ life and work, you would like to learn about, however you can select from our pre-assembled program as well. We also have the Month’s Excellences, containing some of the scientists born in the month. Naturally, we did not forget about the youth. We also created a program using some of the scientists popular among students. What is this exhibition? How does it work? In case of larger groups, please consider that the informational panels on the ground floor (5 available) can only be used by 5 visitors at once, if you don’t have much time we suggest smaller groups of 2-3 people to create and read one program together. 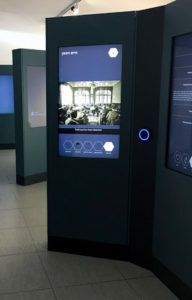 In the exhibition room, on the first floor, there are 15 panels for viewing the full information, for example, a group of 30 can fit in comfortably in pairs. We suggest 40-45 minutes for viewing the full information of 5 scientists. If you plan to visit us with a group of 10 or more please inform us via email at info@zsidokivalosagok.hu! What else can you see here? 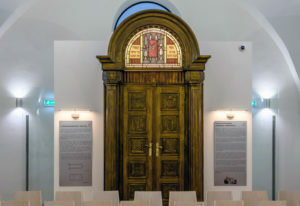 You can see the renovated building of the old synagogue and read about the history of the building and the local Jewish community. Further informational sheets are available at the front desk. 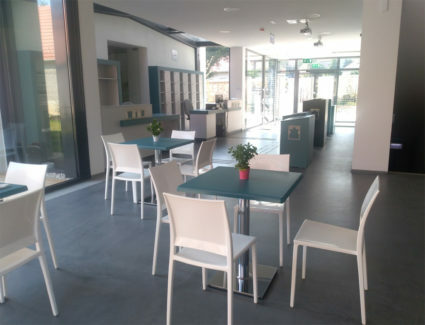 In our buffet, or in case of good weather in our garden, you can sit down comfortably to drink a coffee.